Much of Europe and North America are experiencing their hottest summers in recorded history. Air conditioning does not just make life easier to bear. For the very young and the very old, air conditioning saves lives, but is it healthy? In normally hot Dallas, Texas, for instance, a place where people are prepared for temperatures of 104° F (40° C) and above, already five people have died from summer heat. In Philadelphia, the figure is 25. But in places that have little or no summer cooling, however, the effects of summer heat are almost unimaginably devastating. During the heat wave of 2010, for example, over 56,000 people died of heat exhaustion in Russia. In the heat wave of 2003, over 14,000 people died in France. This year people are suffering from Europe to Brookline, Massachusetts, and heat-related deaths are reported each and every day. Air conditioning can be a life or death necessity for some people. But it can also be a source of minor illness for many others, especially the most vulnerable who need cooling most. People who spend most of the summer in air conditioned homes and offices, researchers at Cardiff University in Wales and the New York University Langone Medical Center tell us, are at increased risk for colds and other upper respiratory infections in summer months. Repeated exposure to cold air after coming in from severe heat is not, Dr. Ujwala Kaza at New York University is quoted as telling the New York Times, the cause of summer colds. Summer colds are caused by colds viruses, just as are winter colds. 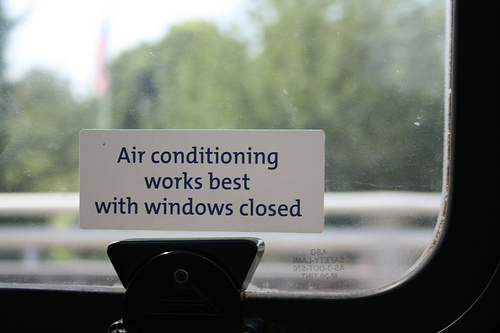 Air conditioning, however, makes infection more likely. Increased rates of upper respiratory infection in air conditioned offices is a well known phenomenon. A study published in 1998 in the journal International Archives of Occupational and Environmental Health found that "sick building syndrome," which the authors interpreted as the use of air conditioning rather than natural ventilation in offices in northeastern France, could triple the number of summer colds among office workers. A study published in 2004 in the International Journal of Epidemiology, found that women who work in air conditioned offices in Paris saw doctors about colds and flu more often and also had more skin problems. One reason for increased infection in air conditioned homes and offices is very simple. The process of cooling air dries it out. Lower humidity in homes and offices dries out the sinuses, nasal passages, and throat. Tiny fissures open in the mucous membranes as they lose moisture, providing easy entry to viruses and bacteria, and reducing circulation of the bloodstream and immune system to fight infection. Also, dirty filters can harbor the viruses that cause colds. Researchers at the Harvard University of Public Health have found that as the carbon dioxide content of the air inside an air conditioned building increases, more and more rhinoviruses survive in the air. Clean filters admit more oxygen from outdoors to fight the virus, while dirty filters provide just enough of an air barrier to keep the virus healthy and infectious. O'Connor A, Really? The Claim: Air Conditioning Can Cause Colds, New York Times, 25 July 2011. Preziosi P, Czernichow S, Gehanno P, Hercberg S. Workplace air-conditioning and health services attendance among French middle-aged women: a prospective cohort study. Int J Epidemiol. 2004 Oct, 33(5):1120-3. Epub 2004 Aug 19. Teculescu DB, Sauleau EA, Massin N, Bohadana AB, Buhler O, Benamghar L, Mur JM. Sick-building symptoms in office workers in northeastern France: a pilot study. Int Arch Occup Environ Health. 1998 Jul, 71(5):353-6. There are essential vitamins your body needs every day to run properly and healthy.